The World Cup's most pointless exercise is the third place game. 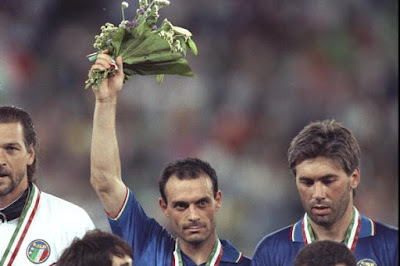 Italy and England had both experienced heartbreaking defeats to Argentina and Germany in the semi-finals of the 1990 World Cup. Nonetheless, this was the first World Cup that I can say I watched knowing what was going on (I was too young for 1986). I had already shed tears in the semi-final, and I wanted a measure of redemption by watching Italy beat England. Seventy minutes passed in Bari before Italy broke through. England goalkeeper Peter Shilton, playing in his last international game, fumbled a ball in the penalty box, and Roberto Baggio pounced on it. The ball rolled to Salvatore Schillaci, who evaded a challenge and passed for Baggio to shoot high into the net. David Platt equalized for England moments later with a towering header, but Baggio and Schillaci combined again to give Italy the victory. Baggio went on an irresistible run through the field, and passed for Schillaci, who was fouled in the box. Schillaci got up and stroked the ball past Shilton to end as the tournament's top scorer with six goals. It was a victory that I celebrated with some enthusiasm, as I watched my heroes deservedly take Italy to a high finish in the tournament.